Jenna shared a drawing of a depiction of her grandfather and grandmother, the late former 41st U.S. President George H.W. 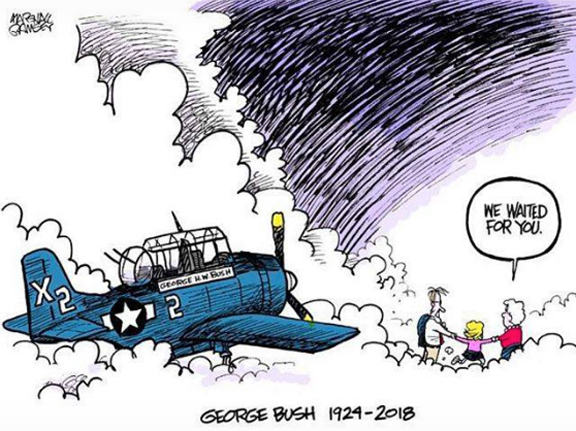 Bush and the late former First Lady Barbara Bush, reunited in Heaven, with their late daughter Robinson “Robin” Bush, the couple’s second oldest child, who died of leukemia at age 3 in 1953. “Waking up missing this giant of a man who gave me everything. He taught me and my family about service, family, decency, the power of gentle words and a beautiful heart. I will miss him desperately but so happy he and my Grandmother are back together. “This brought me such comfort this morning.